This postcard shows High Street and specifically the old Bulls Head, ie what is now 18 High Street, the licence having transferred many years ago to what is now the Quorndon Fox. The photographer was William Shuttlewood (chemist) who lived in Quorn with his wife and three children for a relatively short period -from about 1905 to about 1909. However he obviously enjoyed photography and Quorn owes him a great debt for the wonderful pictures he took at this time. Many examples of his work can be found in the collection and his full story is told elsewhere on the site. 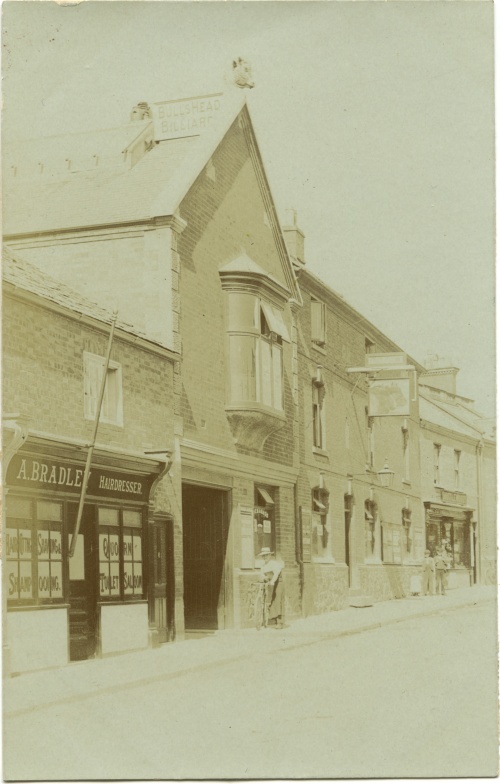 The stone bulls head on top of the gable can be seen today, although the 'Bulls Head Billiards' sign has long gone. The bow window on the first floor has also been replaced. The sign above the Bull's Head pub sign, says 'Free House'. Timetables for travelling to Leicester can be seen on the wall of the pub and in the window there is a poster referring to pool. Above the shop (far right), it seems to say 'Stationer Chemist', and above that there is a sign saying 'Shuttlewood'.